Carmen Maldonado Munoz is 35 years old and has five children. She is currently renting a one bedroom house with 3 daughters and 1 grandchild. Her daughters are, Karla Denise Saenz Maldonado, (19 - and has two children), Aridelzi Alejandra Maldonado Muñoz, (18 and has one child), and Luz Jerusalén Valenzuela Maldonado, (7). Carmen’s son, Juan Carlos Valenzuela Maldonado, died from leukemia in 2017. During the last years of his life, Carmen took him to Hermosillo frequently for medical care. Her two oldest girls would like to finish their high school education and learn to speak English to open up more job opportunities. Carmen works in a local restaurant and makes between $50 - $100 per week depending on the season of the year. She sold everything she could to pay her son’s medical expenses. Carmen says that if she had a home she would be able to provide support and toys to sick children as she promised her dying son that she would. Placido Martinez Martinez (65) is married to Silvia Isabel Perez Mendivil (age 63) and has earned a living doing a wide variety of things including making blocks; making charcoal; making and selling chorizo and cheese; and running a small food store. On April 2014, one of his legs had to be amputated because of circulation issues due to diabetes. His life changed because of the amputation. In May 2017, his second leg was amputated. And not long after that the house that he was renting was taken back when the owner’s family moved back to Puerto Penasco. Even as a double amputee he continues to be a strong leader of his family and their respect for him is apparent. Just recently he received his second prosthetic leg and is learning to walk with the help of a walker. Yaneli Noemi Morales Miguel is 26 years old. She has three children, Joana Noemi Gomez 9, Jovani Gomez 6 and Yaneli Victoria Gomez 4. She is married but has been legally separated from her husband because of abuse. She, her three children, her brother and mother live in a one bedroom house. They cook on an open fire outside. Yaneli makes piñatas, candy, earrings and other jewelry to sell. She does not have any support from her husband, but she does an amazing job of caring for her children and is resourceful, pleasant and engaging. She laughs easily. She would like to get training at the community center to do nails and/or hair. Her oldest child Joana would like to play baseball and Jovani would like to be a cheerleader but they don’t have the money for these activities. Jesus Vazquez Sanchez is 37 and his wife Maria Fernanda Sanchez Cantua is 27. They have been married for 2 years. Jesus was shot 18 years ago and is in a wheelchair due to the injuries to his lung and spine. He works at the restrooms on the Malecon to collect the charge at the restroom and earns 2,500 Pesos monthly. He has medical needs related to his injuries including kidney infections that have a significant impact on their financial stability and some months it is difficult to pay the rent because of the medical expenses. Maria works with optic lenses and earns 5,000 Pesos a month. Jesus plays wheelchair basketball on the Rolling Rockies team. He also plays the guitar at his church. He would like to learn to make ice sculptures. Jesus is a soft spoken, articulate, charming and gracious person. We first met him a rehab center where he was volunteering to assist the doctors treating other patients. They are resourceful and want to help others in physical therapy. This is truly an impressive couple. 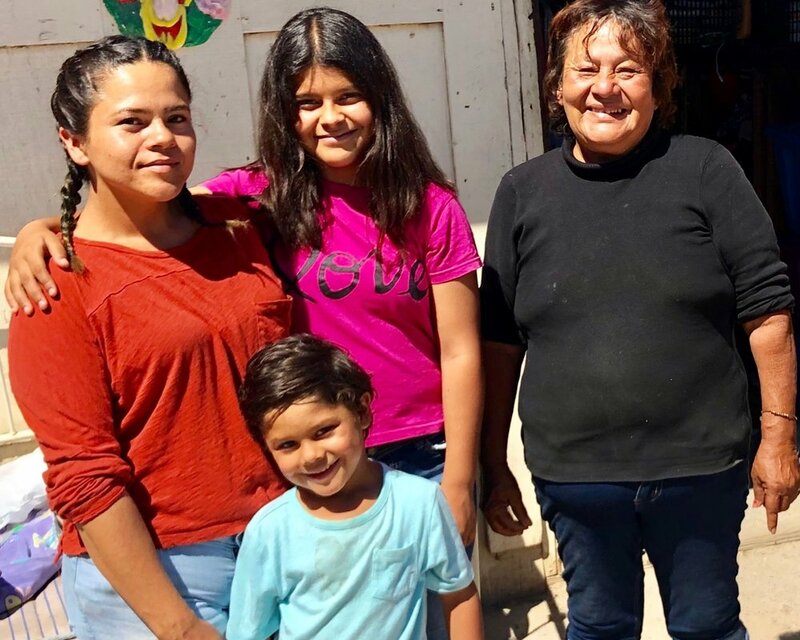 On March 31st of this year Cruz Toriz Castro 58 (mom and grandmother), Marlenne and her children, Evelyn (10) and Elicseer (5) lost their home and belongings in a fire. The entire family are Puerto Peñasco natives. Marlenne and her mom have dealt with various personal challenges over the past several years, and now with the loss of their home and belongings being the most recent. Cruz works full time and Marlenne works part-time and is committed to doing what she can to make life as normal as possible for her children as they deal with their housing situation. A Dwellings home would go a long way towards helping to bring hope and new start. Please consider helping Marlenne and her family by providing a home and a brighter future for her children.